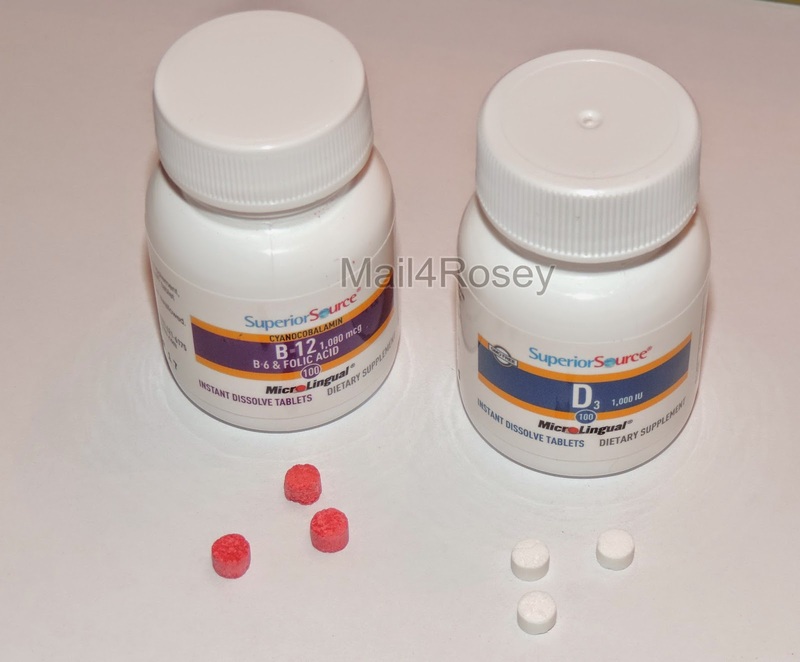 Mail4Rosey: #SuperiorSource Vitamins Dissolve (with #giveaway)! #SuperiorSource Vitamins Dissolve (with #giveaway)! (great for when you have a hard time, or don't like swallowing a pill). One winner will get everything shown in the picture, including the Stevia. If you have a hard time swallowing pills, or you prefer vitamins that dissolve under your tongue versus the kind you swallow with water, this is the company (and giveaway!) for you. 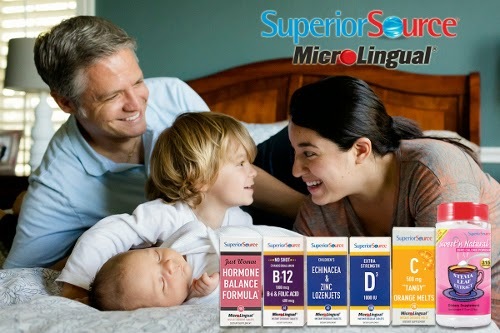 Superior Source Vitamins, with their MicroLingual technology absorb quickly into your body, by quickly dissolving under your tongue. This is great for not only those who don't like pills, but for everyone! According to Superior Source, as much as 50% of the potency of a vitamin can be lost when taken in pill form because of the high acid content in everyone's stomach. It just makes good sense then, to give the tablets that dissolve a try! You will get more vitamin for your dose, and a better value for your money too. That's pretty win-win. The Vitamin C Tangy Orange Melts were the largest of the tablets. They are so soft, and dissolve so fast, that taking one was a breeze. Size-wise, the largest of the easy dissolve tablets was the Vitamin C. They weren't too awfully big, and they dissolved quickly, so it was very simple to take them. The B-12 and D easy-dissolve tablets were the smallest. And then the smallest version of the quick-dissolve tablets, in the package we received (the same one a lucky winner will receive) was found with the Vitamins B & D, and they were truly practically gone in a flash. I think it's wonderful that Superior Source has focused on creating vitamins that are so easy to take. It's a great resource for those who do not like to, or cannot easily swallow pills. I will be recommending these to someone I know who falls into one of the above categories, and I will be taking the Vitamin C dissolve tablets here on my own. With cold weather season here, it can't hurt to keep my immune system boosted, and I hear Vitamin C is wonderful for doing so. Whether or not that is true, I don't know, but it certainly isn't going to hurt anything to take them, and it might actually end up helping. 1. Extra Strength Vitamin D 1000 IU: Vitamin D works in conjunction with Calcium to help develop and maintain strong bones and teeth. Superior Source offers a new Extra Strength 1,000 IU Vitamin D which can help to ensure optimal health, as stated in a recent review study. All Superior Source Vitamin D products are D3, the finest source. Vitamin D is essential in maintaining eye health and also helps maintain skin, teeth, eyes and the immune system. 2. 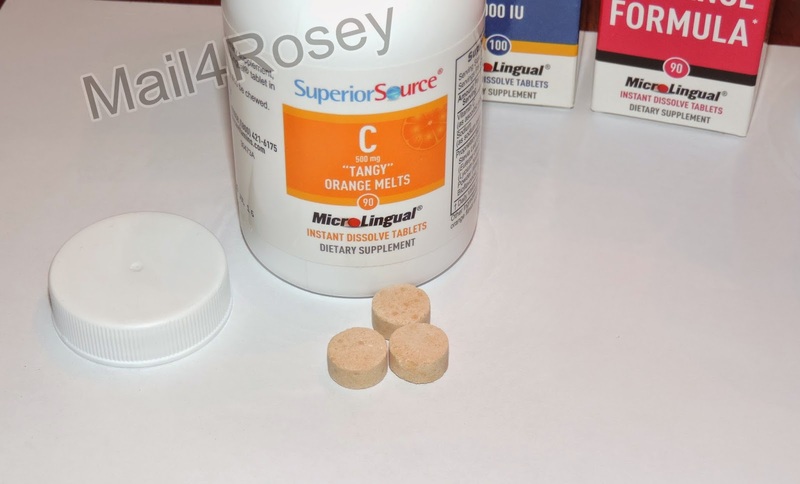 Vitamin C "Tangy" Orange Melts 500 mg: Vitamin C is an essential nutrient that cannot be produced by the body, therefore it must be replenished daily. Vitamin C also provides support to the body's immune system, very helpful in a season where people catch colds and flu. No sugar is added, these products are only sweetened by stevia; this is preferable to most 'chewable' vitamin C products that are typically loaded with lots of sugar. 3. Just Women Hormone Balance: Our Just Women-Mature Healthy Balance formula combines key vitamins with selected herbs to support the body's optimal health for mature women. 4. Children's Echenacea: Zinc is an essential mineral required by more than 300 enzymes for the support of multiple systems and functions in the human body. Studies have indicated that zinc promotes recovery from the common cold and related symptoms. Superior Source Zinc Lozenjets are formulated with an herbal blend as added protection for children's health and immune system support. 5. Vitamin B12 Folic Acid 1000 mg: No Shot B-12 / B-6 / Folic Acid "Instant Dissolve MicroLingual" go to work fast! Just place one MicroLingual Tablet under the tongue and within seconds the Sublingual Micro-Tab is dissolved and the nutrients are sped into the blood stream. The combination of B-12 / B-6 & Folic Acid provides essential nutrients for the well being of the heart, by working synergistically to achieve a lower Homocysteine level which in turn lowers the risk of developing heart disease as well as providing nutritive support for healthy cardiovascular functions. 6. Sweet 'n Natural Stevia: Stevia naturally sweet dietary supplement used for both hot and cold beverages. The glycosides from the stevia leaf, called steviosides, are an amazing 200 times sweeter than sugar. Studies have shown that steviosides, may support healthy heart function, help to protect the teeth from dental caries and promote healthy blood glucose levels. Superior Source uses the finest raw materials and a unique blending and manufacturing process to produce the smoothest tasting stevia available with no aftertaste. Where to Buy: You can purchase all Superior Source Vitamins at major retailers nationwide like Whole Foods and Vitamin Shoppe and major online retailers like, Vitacost, iHerb, Puritans Pride, Swansons and Lucky Vitamins. To learn more about Superior Source Vitamins, you can visit their website. You can also follow them on Facebook and/or Twitter, and access retailers here. One winner gets all of the above. US entrants only. My father takes lots of vitamin supplements, so I will definitley tell him about this. It would be awesome to get them all in one place. Carmen Perez: This sounds fantastic. My daugher hates to swallow pills, I have to look into this! Oh these are great. I need to look into them. My son has to take extra vitamins and he can't swallow pills. I have to crush them up with water and give them through a feeding tube. These would be much easier. I think Jason would really like these. He is big on taking vitamins daily, and even more so now that he works out on his lunch break. Dissolving ones are some of the best, as it gets in your system more. I have chewable vitamins right now, but these would be a great replacement. They would be great for people who can't swallow pills! I would love to try these. My doctor just put me on vitamin B2. And I think I want to add more to my daily in take. I will check these out! Vitamins are so important! I love the discounts too! I like that they have a healthy hair supplement. I could use that. I like that they dissolve. Do they offer a kids line as well? I love the fact that they dissolve too, Vitamin D is so important, my mom has to take them everyday too. I have a few friends that have a hard time with pills. They could really benefit from this. I'll pass it along. I like their Just Women MicroLingual® supplements for Antioxidant, Healthy Skin Connection. I also like that they dissolve so easily. I have never heard of Superior Source Vitamins before but I know it is important to have quality vitamins. These would be great for my parents. I have a daughter who cannot seem to swallow pills. I think a lot of people and kids have that problem. Smart move for this company to come up with this technology. I learned quite a bit about microlingual tablets. I had heard of sublingual but never micro! I learned about the micolingual pills. I learned that they have a bunch of different products. I like that they carry a Muscle Helper and a Head-ade Helper, both of which would be awesome. I do think this is quite effective. Seems something I have to share. Sounds fabulous! Vitamin supplements are so important. Soft and water dissolving tablets would be very helpful to feed kids. Will have to check this out for my girl and I am going to share this with my friends as well. I would like to try the Healthy Hair vitamins!! I can't swallow pills for some reason! Ack! This would be so helpful for me! I'd like to try the Just Women – Healthy Skin Connection. I know my niece had a hard time swallowing pills. This would be such a good thing for her! I've not heard of this brand before. Sounds like a great brand for those looking for vitamin supplements! I love that they have a children's line! Especially the Child Formula Echinacea & Zinc Lozenjets that we could use in our house right now. These are the B12 I have in my medicine cabinet. I'd like to try some of the sleep helpers. I liked (and still do) their vitamins and supplements. I have taken the, and find them of good quality and much easier to take, especially the sublingual formulae. Hi! I learned that they carry many of the MicroLingual type of vitamins. I like that they dissolve under the tongue quickly! Thank-you!! I would like to try the Hormone Balance Formula. I like that they offer dissolving vitamins-I don't like to swallow pills! The owner is really buff! I like the huge variety they have. Looks like you can get everything there! I love that these dissolve under the tongue. I like that there's several different places I can purchase their vitamins at. I learned that they instantly dissolve. I am taking the gummy vitamins now and they are hard to get out of the jars, they stick together. I would love to try these dissolving under my tongue. I like that these vitamins dissolve under your tongue. I like that they dissolve in seconds. Since I hate taking pills, I like that they are easy to swallow!